Rachel Johnston's family has started a legal claim for negligence, saying medics failed to discuss risks of the treatment she had for tooth decay. Lawyers acting for Ms Johnston's family claim a series of errors led to her death. The family claim that because Ms Johnston lacked the capacity to make a decision, her mother Diana Johnston's concerns should have been taken into consideration by medical staff. Mrs Johnston, who lives in Evesham, Worcestershire, said she wanted "to get justice for my baby". "I don't feel that I was properly consulted, or that Rachel's treatment was discussed properly," she added. "Things should have happened very differently. I wanted them to take a few teeth out at a time, maybe two at a time and give her a chance to recover. "I wanted to make sure that she was safe. Her life was in my hands." Ms Johnston's suffered cerebral hypoxia and aspiration pneumonia after having her teeth out, a post-mortem test found. Caron Heyes, from legal firm Fieldfisher which is representing the family, said Mrs Johnston was not told how many of her daughter's teeth were removed. 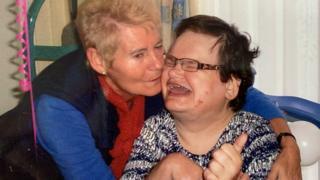 "She [Mrs Johnston] found out after a learning disabilities mortality review investigation was launched," she said. "Prior to surgery, Diana clearly stated that she did not think complete extraction was the right option for her daughter." In a statement, the three health organisations dealing with the case - Worcestershire Health and Care Trust, Worcestershire Acute Hospitals Trust and Wyre Forest Clinical Commissioning Group (CCG) - said: "We would like to express our condolences with Ms Johnston's family for their loss. "Both trusts have completed internal serious incident reports, which is usual in a case like this, and are also participating in the wider review led by the CCG looking at the care provided by all of the agencies involved." It said the reports would be shared with Ms Johnston's family. A three-day inquest is set to take place in August at Stourport Coroner's Court.